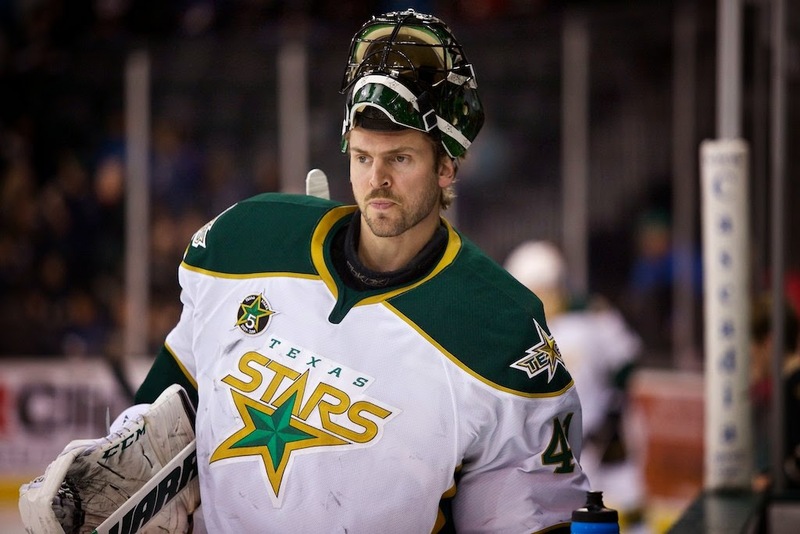 100 Degree Hockey - Texas Stars Hockey News: Cristopher Nilstorp Credits Improved Play to Relaxing, Taking Things "Game-by-Game"
Cristopher Nilstorp Credits Improved Play to Relaxing, Taking Things "Game-by-Game"
Somewhere lost among the goalie-centric storylines of Jack Campbell's recovery and the trade for Tim Thomas has been the quietly confident and solid play of Texas Stars goalie Cristopher Nilstorp this season. After starting out the season on a 4-8-1 record, Nilstorp has lost just four regulation games since December 1st, going 17-4-3 in that stretch. He is now backing up Tim Thomas in Dallas as Kari Lehtonen recovers from a concussion. The callup is a solid reward for his improved play. Nilstorp admits that something didn't feel right in his game at the start of the season, which led to his uncharacteristic record. "I had a tough start to the season," he said. "I had lost my game a bit. I was all over the place in the net and wasn't playing my game at all. I tried to calm down." After a stellar first season in North America that saw him win 19 games and be named the playoff starter for the division champs, something wasn't right. "I was definitely overreacting [on the ice]. I wasn't comfortable. Sometimes in the season you feel weird. There was that moment in my season that I didn't." Nilstorp took the process of improving his game and getting back to comfort day-by-day, speaking often with Dallas goalie coach Mike Valley. The two converse in Swedish, which Valley learned thanks to time spent in Sweden during and after his playing career. "He just reminds me of the small things. Have fun. Relax. It's the same puck and same ice everywhere. Just play each game. Do the best you can because that's all we ask for. Sometimes it's hard though, it's easy to talk, but it's hard to go out there and just relax." While he may not get a start before Lehtonen returns, the Swede is taking his time in Dallas as a learning opportunity working behind Stanley Cup winner Tim Thomas. "He's an awesome guy. He works so hard in practice. I'm trying to see what I can learn from him because he's a guy with a lot of experience. I may be a veteran now but I keep learning." Overall, Nilstorp is just keeping perspective on the entire season. "I was looking too far away, so I try to go game-by-game now. I try to keep it simple and have fun with it. Now I feel great. I'm having fun out there, and it's great to be around these guys."